I had a Pinterest account before I started Polished Habitat, but I’m just now realizing it has serious life organizing potential that I was ignoring. For years, I’ve browsed Pinterest and repinned things, visiting any interesting sites I found along the way. I rarely DID any of the things I pinned or even went back to my boards to look at them again. It’s time to change this, my friends. It turns out that with some intention and organization, the time I already spend on Pinterest can make my life more sane and organized. After writing the rest of the post that feels like a love story, I felt the need to say this is NOT sponsored by Pinterest in any way. It’s just the tool that I’ve found the easiest to keep all these aspects of life organized. It DOES help me when you pin from my site and I appreciate it big time, but that’s a whole different topic for another day. 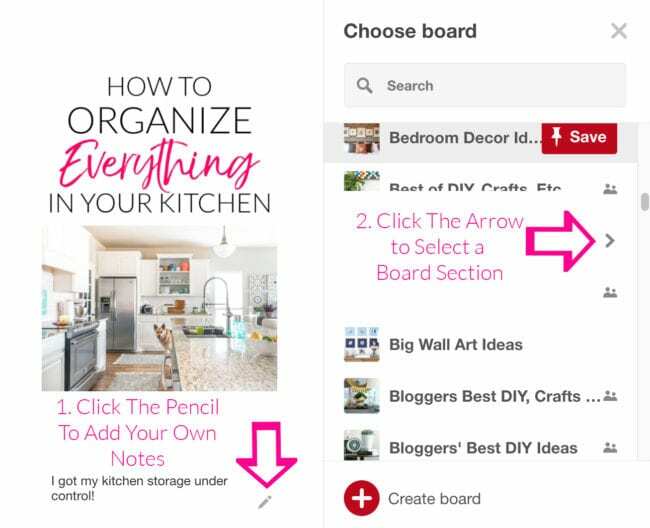 If you’re new to Pinterest or aren’t sure how to create your own new pins from any website, there is a more general Pinterest tips section toward the end of the post. I think it’s worth scanning even if you’re a regular user. Before we get to that, let’s dive into the specific ways I’m using Pinterest to keep our lives organized. We’re in the overwhelming part of travel planning for a summer trip. The destination isn’t 100% finalized, but we’ve narrowed it down and started researching things to see and do. My ridiculous method of trying to keep everything straight involved leaving tons of tabs open on my laptop so I wouldn’t forget specific hotels or activities. 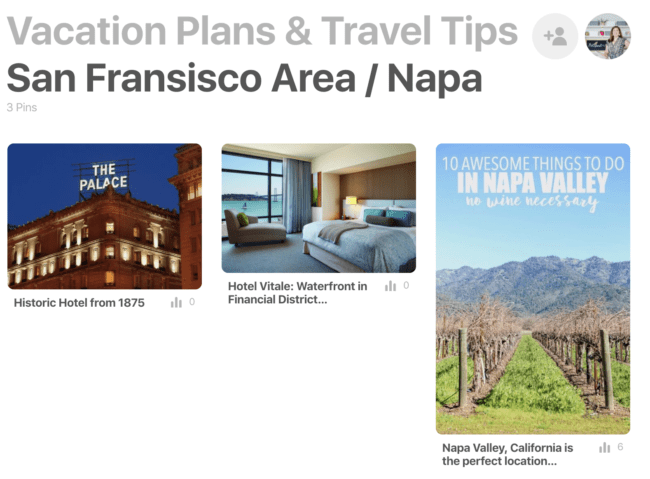 Then I got smart and created Sections on my Vacation Plans & Travel Tips boards for a few specific destinations. While I was reviewing hotel options for an upcoming trip to San Fransisco, I realized I could pin directly from the home page of each hotel and make any notes I want to remember in the description field. Now I can stop trying to remember the names of my favorite options and why I liked them! As you can see, the two hotel photos aren’t the prettiest pins ever, but they are doing the job of creating a reminder for me. We’re contemplating spending a couple days in Napa on the same trip, so when I saw a pretty Napa pin, I added that to the San Fransisco section as well. Anytime we’re seriously discussing a destination, I’m going to create a new section for it as step one in our planning. The key to this process being effective is remembering to pin anything you’re interested in during your research. When I’m looking at reviews for everything from whale watching to foodie walking tours on TripAdvisor, I can hit my Chrome Pin It button and save a link right to the tour page. Having the destination specific board section will even be handy while traveling. If we find ourselves with an unexpected free afternoon, I can pull up the Pinterest board right from my phone to see my own personalized collection of things we were interested in! Within my Vacation board, I also added sections for travel organizing tips, local/weekend driveable destination ideas, and a broad category of other potential destinations for future review. Over the years, I’ve pinned WAY more food on Pinterest than I’ll ever actually cook. It turns out, like most things in my life, that I just needed a good system to move me from pinning to doing. For each one of those categories, I recently created a second section with the same name, followed by “favorites”. When I find a new recipe to try on a website or in my Pinterest feed, it goes onto the appropriate segment. After we’ve actually made and eaten a dish, I’ll move it to the favorites board if it’s a keeper. When we’re ready to meal plan for the week, I’ll be able to quickly see all the recipes we’d love to repeat! If you want to sub-divide things even further, you could have separate boards for each meal, and use the sections to break them down. So, a dinner board may have sections for beef, chicken, fish, and vegetarian recipes. The biggest keys are having an easy way to find pins during meal planning or entertaining prep AND having a way to identify what you have already tried. I’m even going to go back through my favorites on AllRecipes and add them to the appropriate segment so all my online recipes will be in one spot! First, you’ll want to mark your Gift Idea board as secret so the things you are pinning won’t be shown to anyone else. Then, create sections for each person or group of people you buy/make gifts for. I have a mix of sections with individual names (like my husband) and then some that are a little more general, like “nephew gifts”. Like the other topics, you can either pin existing content from Pinterest, add your own pins right from Amazon (or any other store) while you’re browsing, or create pins from blogs you love. Before the holidays, there are tons of gift guides published and I love pinning them so I can revisit the ideas when I start shopping. You can also watch for DIY projects throughout the year that would make great gifts and add them here. Don’t be afraid to save the save pin to more than one board if you want to remember it for multiple recipients! I haven’t done this yet, but it just occurred to me that I should also have a segment for gift ideas for myself. Throughout the year I could pin things I love to it, and it will be so much easier to create a wish list when I’m asked for one at Christmas. Of course, this is my favorite! Like the others, there are several ways to organize, but you’ll want either separate boards for each room in your home or one decor board with sections for each room. I have boards for each room – so Bedrooms, Living Spaces, Kitchens, etc. since I pin SO many things for our house. It’s pretty fascinating because when I go back to look at my room boards, I can get a good sense of my overall design style. I bet if you can see some trends in yours as well. 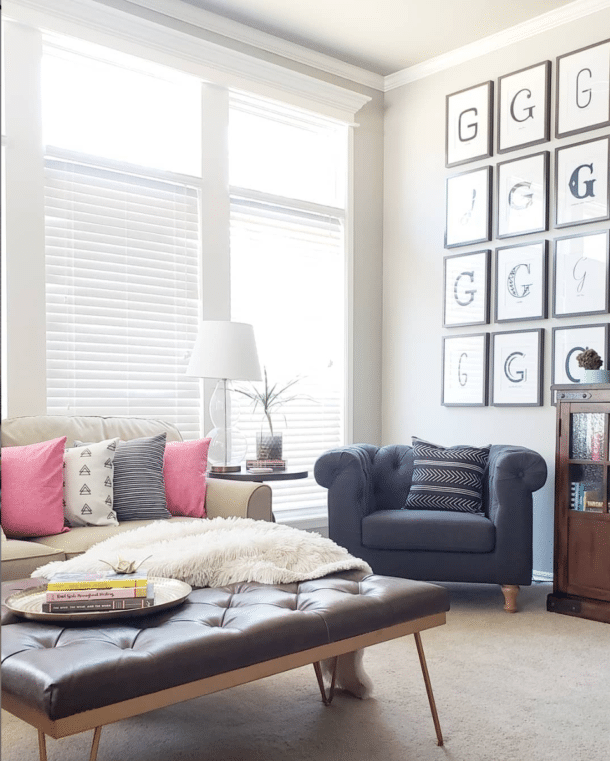 In addition to helping you become aware of your overall style, you can also use Pinterest to keep track of options when you’re working on a specific room update. For example, your kitchen board may need a segment of just barstools to gather every option you love before making your purchase. I’m going to do a whole post about that as part of the design method series, so make sure you sign up for the email list if you’re interested in that! Now that we’ve got your brain spinning with potential, here are a few other board ideas to consider creating. Priority Projects – I’ve realized that the things I pin are a mixture of photos that I want to save for an unknown point in the future and ideas that I want to try ASAP. But those Veruca Salt “I want it now!” projects always get mixed into the others and I forget about them. Creating a priority board (or segment within another board) will help move me to DO more projects because I’ll be able to quickly find my favorites. Fashion/Clothing Ideas – You can create sections by season and/or for special events. Fitness Ideas – I always see great work-out routines online and I love the thought of gathering them in one place and moving favorites to a separate segment once I’ve tried them. Books to Read – Pin from Amazon & online reviews, using sections for Fiction and Non-Fiction and moving those you’ve read to a separate segment. 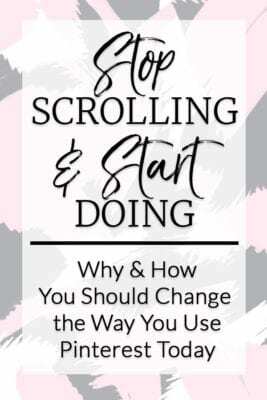 I use Good Reads for this, but if you don’t already use that, Pinterest is a great option. Think of Pinterest as one giant filing cabinet. Boards are the equivalent of big hanging file folders. And previously you couldn’t organize within the boards. So if your board (hanging file folder) was Recipes, you’d have the desserts mixed in with entrees. Everything was related to food, but you couldn’t quickly find something specific on the board later. 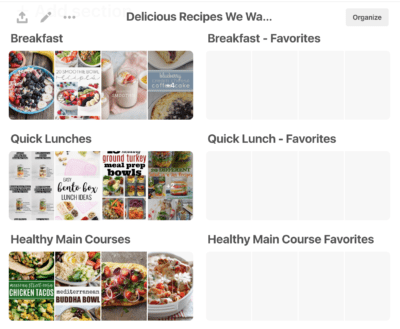 Now, Pinterest added board sections, which are like manila folders sub-dividing the hanging folders into logical groups. More organization for the win! 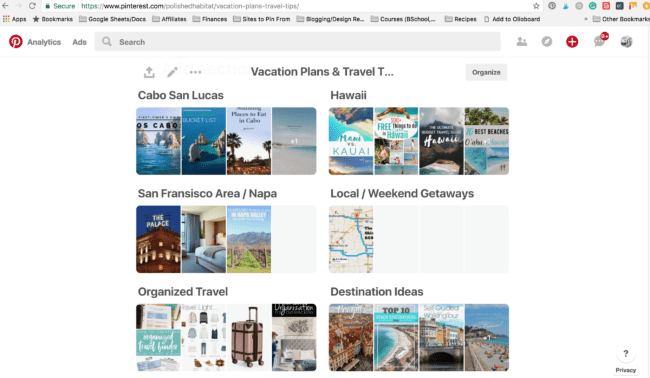 The addition of the sections is what made me really step back and think about how I could use Pinterest as a storehouse for things previously stuck in my head or on various physical notes. Once you have an account, you can scroll through the Pinterest home feed, click on the following feed (the icon with two little people), or use the search feature to find existing pins that interest you. The following feed is a new feature that is closer to “old Pinterest” before they changed to the “Smart Feed”. It’s more chronological and focused on what people you follow are pinning that day. I love it! Many sites have Pinterest buttons incorporated and you can use them to create your own pin. However, if you don’t have the Pin It button in your web browser, it’s really handy and my preferred way to create pins. It puts a little button on your screen to make it simple to create a pin from any website. And not just blogs – you can pin from stores too. It’s free, and you can get it here. Once you click your Pin It button, a screen of photos will come up from whatever website you are on (like the example above). When you click on whichever image you want to pin, another box will come up and you’ll have a chance to add your own description/notes if desired and then select which board you would like to save the image to. Once you’ve clicked on the board, your pin is saved and you can free your mind from trying to remember whatever it is you pinned! Some of my boards were full of ideas ready to be organized in sections. Thankfully, that is pretty easy now. Visit your board and click the Add Section button. Name and Save the Section. Then, back on the board view, click the Organize button at the top of the screen. You’ll be able to click on any existing pins (up to 50) on that board that fit your new section. When you’re done selecting them, click the move button at the top of the screen and select your new section. When you see a pin you like on Pinterest, click on the image to view it larger. Then, click on the Visit button to see the full website where the pin came from. If you make a project or recipe from the pin, try to make a mental note of the site it came from so you can share the original source if anyone asks. I know we all have way too much to remember, so don’t obsess over it, but I’d love it if I heard someone say they organized their closet after getting ideas from Polished Habitat vs after getting ideas from Pinterest. Sometimes when you click on a pin to visit a website, you’ll quickly realize that the website you end up on does NOT match what the pin said. Unfortunately, there are some shady people that will steal popular images and use them to generate traffic to their own website. If that happens, make sure you do NOT repin the image to your board because we don’t want to spread it. Image theft is a HUGE problem right now and Pinterest says they are working on solutions, but it can’t come fast enough. I know this was a lengthy post, but I hope the mental-shift in how you use Pinterest in the future will be well worth the time it took to read. I know I’m ready to spend more time using the ideas I get from pins now that I can easily find them again! Wow! This truly is brilliant and such a great and detailed resource, thank you! Off to organize my pinterest boards! Thank you so much, Kim! I’m THRILLED you appreciate the detail! I started writing it last week thinking it would be a quick post, but day after day I kept having more to add and feeling like it wasn’t “done”. I’m glad all the hours spent pulling it together paid off! I hope you love it this time! If only I could log in to my Pinterest account, I could use these brilliant tips. I have contacted Pinterest 3 times, and all they can say is that it’s a “known problem” and “thank you for your continued patience.” I keep getting the error message “failed to fetch.” If you have any ideas, I’d sure appreciate it. Oh no! That sounds horribly frustrating. I’d be pretty tempted to just start a new account with a different email address at this point. I wonder if you could view all your pins not logged in so you could repin your favorite to your new account? You should be able to see them at pinterest.com/yourusername/pins I hate that the issue is happening though! Thank you! And yes – I didn’t fully get the sections at first, but once I started playing with them, I realized they were brilliant! Great blog. Thanks. I love the ability to sort within my folders. Makes it easy to find things. Like your idea of a sub folder for receipt favorites. I have some sites that show up in my feed and or Facebook that I can’t pin directly to pinterest. Instead I have to save it elsewhere or email myself and save it in a folder there. Thanks Sallie! Emailing the others to your self is a great idea too! Thanks for sharing your thoughts on this. I think many of us get on Pinterest and just begin to willy nilly roam around. It is wonderful to have some guidance in being organized in this aspect of our lives as well. This is a great post with so many good ideas. I did not know about the categories within a board so I’ll be using that very soon. I think I want to go in and pretty much start over on Pinterest. Hopefully I can figure out how to delete things and make better organized boards. Pinning is fun. Thankfully you can delete up to 50 at a time using the same steps I mentioned toward the bottom of the post when I was telling how to move pins to different boards/segments! After clicking organize and selecting the pins, you’ll be able to delete. Happy organizing! Thank you thank you thank you!!! I need the ideas you brought to this post so much! My pinterest boards are like small black holes that I spend too much time searching through to find the one I want/need each time. YES! “Small black holes” is the perfect way to describe my boards too. 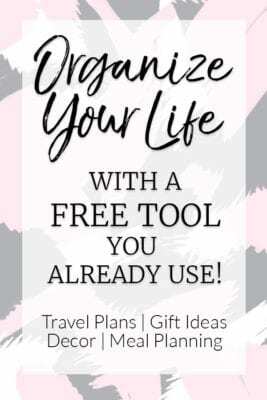 I hope you love this new way of organizing as much as I do! Re. 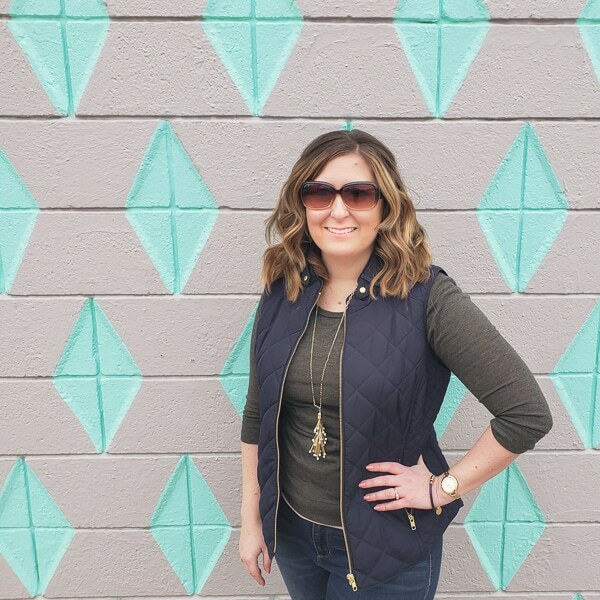 Meal Planning – one thing I was doing for awhile was making a monthly meal planning board so my recipes were seasonally appropriate – I grill in June but not January and the reverse is true for my crock pot. Then the next year, I could look at the board for that month and have the appropriate recipes easily at hand. I’ve fallen out of the habit, but this was great for me for a few years! Oh my goodness, that’s a brilliant idea! Isn’t it crazy how we fall out of things that are working really well for us? One of my goals this year is to catch myself getting out of good habits sooner so I can slide right back into them. Or at least make a conscious decision that they don’t make sense anymore instead of staying on autopilot. I love Pinterest. These are great ideas! I tend to use it a lot when planning renovations for our house. I like that I can explore so many ideas. And stolen pins frustrates me too – rather than repin or not, best thing is to do report the pin straight to Pinterest under this is not what I expected option. That way they can follow it up and actually do something about it. Great article! I’m currently in the process of decluttering my Pinterest pins. I love the new features of sections and the organize button. Makes sifting through a lot faster. I’m going to use your tip about recipes that I’ve tried and like. Fantastic idea to speed up meal planning. Always enjoy your blog! Thank you Lisa! It’s surprisingly satisfying to declutter and organize pins! Great post. Very clear and yes, lots of info but it reads really easily. Have you discovered a quick way to jump to the board to which you are pinning the link? If pinterest doesnt suggest the board, I have to scroll to “reciepes” which on my phone is alot of scrolling. Have you discovered a better way to locate the right board? Thanks. Hi Francine, On mobile right now, scrolling is the only way to find them. Instead of slowing scrolling, if I know the board is at the bottom, I can make a flinging motion on the phone with my finger and it’ll fly quickly past a bunch of boards at once. The faster I fling, the faster the list moves. Plus it makes me feel like I’m on the Price is Right or something. 🙂 On a computer, it’s a bit easier and they still let you type in the board name. Hope that helps!